Your comments and highway safety related articles are welcomed. This newsletter is intended to be a source to increase highway safety awareness, information and provide resources to help save lives. You are encouraged to submit highway safety articles that might be of value to the highway safety community. Send your comments, questions and articles for review (electronically) to: janet.ewing@dot.gov. If you would like to be included on the distribution list to receive your free issues, please send your email address to: janet.ewing@dot.gov. One of the things that President Obama has emphasizedin the implementation of the Recovery Act is not only the lives it can improve, but also the lives it can save.Building on that theme, the FHWA has done a number of things to ensure that highway safety receives high priorityin the implementation of the Recovery Act. On our national web site, we have identified opportunities to use Recovery Act funds for highway safety projects, as well as tools that can be used to support and justify those safety decisions. Recognizing that almost 60 percent of all fatalities occur on rural roads,FHWA has put particular emphasis on educating local governments about the details of the Recovery Act and how to work with their State DOTs to advance projects. Nearly 1,000 people participated in two national webconferences on safety and the Recovery Act that we offered at no charge to local governments. The Recovery Act offers us one more opportunity to improve safety, but we need to recognize it is just part of a much larger pallet of tools and initiatives that we have built over the years to make alasting improvement in highway safety. We need to take advantage of all these resources to end deaths and serious injuries on our highways. Thank you for your continued dedication to making our roads safer andsaving lives. On February 17, President Obama signed into law the American Recovery and Reinvestment Act (Recovery Act) of 2009. 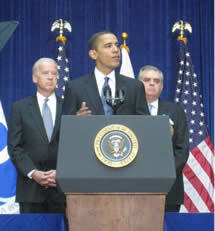 President Obama and Vice President Biden joined Transportation Secretary LaHood on March 3 at USDOT headquarters in Washington, DC, to mark the release of $26.6 billion in Recovery Act funding for State and local transportation authorities to repair and build highways, roads and bridges. “This investment in highways will create or save 150,000 jobs by the end of next year, most of them in the private sector,” President Obama said during his speech to DOT employees. “The jobs that we’re creating are good jobs that pay more than average; jobs grinding asphalt and paving roads, filling potholes, making street signs, repairing stop lights, replacing guard rails,” he added. State highway departments have identified over 2,000 projects in 50 States and territories, totaling over $6 billion. The U.S. Department of Transportation will monitor State compliance and track job creation. Information on the projects will be posted on www.Recovery.gov. At the ceremony, the President unveiled new logos for government-wide Recovery Act projects, and the Transportation Investments Generating Economic Recovery (TIGER) logo for transportation projects completed under the Recovery Act. ……Of the 3.5 million jobs that will be created and saved over the next two years as a result of this recovery plan, 400,000 will be jobs rebuilding our crumbling roads, bridges, and schools, repairing our faulty levees and dams, connecting nearly every American to broadband, and upgrading the buses and trains that commuters take every day. Many of these projects will be coordinated by Secretary LaHood and all of you at the Department of Transportation. And I want you to know that the American public is grateful to public servants like you -- men and women whose work isn’t always recognized, but whose jobs are critical to our nation’s safety, security, and prosperity. You have never been more important than you are right now, and for that we are all grateful. But what makes this investment so important is not simply that we will jumpstart job creation, or reduce the congestion that costs us nearly $80 billion a year, or rebuild the aging roads that cost drivers billions more a year in upkeep. What makes it so important is that by investing in roads that have earned a grade of D- by America’s leading civil engineers -- roads that should have been rebuilt long ago -- we can save some 14,000 men and women who lose their lives each year due to bad roads and driving conditions. Like a broken levee or a bridge with a shaky foundation, poor roads are a public hazard -- and we have a responsibility to fi x them. Each and every one of you has a critical role to play. And if you do your work, if you do your job as well as you can do, if you feel as inspired as I do about the work that lies ahead, I’m absolutely confi dent that we’re going to look back on this time and say to ourselves this was a moment where we really made a difference. What an extraordinary opportunity that is. I hope all of you seize it. …..Mr. President, you also made it clear that we have an obligation to the taxpayers of this nation to make sure their money is being used wisely, to make it accountable and transparent. Our web site, Recovery.gov, is an unprecedented resource for the people to see how their money is being spent. Title XII of the Recovery Act includes significant new funding for transportation infrastructure. To assist all State and local agencies, FHWA has established a Recovery Act web site located at https://www.fhwa.dot.gov/economicrecovery. The web site includes a series of key questions and answers (Q&As). The site will continue to be updated as more information becomes available. Including safety strategies in the economic recovery delivery. Incorporating safety features in existing “Ready to Go” Recovery Act projects. Many safety improvements can be easily and cost-effectively incorporated into existing “ready to go” projects without changing the scope or delaying the project. This is particularly important to remember, since Recovery Act projects must meet the same safety standards as any other Federal-aid project; there is no legislative exemption. However, making small changes to these projects can produce big safety benefits. For example, incorporating rumble strips into a resurfacing project can cost as little at $600 per mile, and the benefits in terms of reductions in fatalities and serious injuries are dramatic. Using existing safety plans to identify potential projects. A Strategic Highway Safety Plan (SHSP) is a good starting point for identifying safety projects that can be implemented, constructed and advanced quickly. These safety strategies can be developed into stand-alone projects or, just as importantly, they can be used to enhance the safety of projects already in the planning, design or construction phase without negatively impacting progress. The Recovery Act is an opportunity to accelerate the implementation of these safety action plans, and the sooner these safety features can be put in place, the sooner they will save lives. Furthermore, many State SHSPs include a data system improvement element. Improved data systems, including the capability to locate crashes on all public roads and develop affiliated roadway inventory data, are eligible activities. Many such projects do not require the same intensive planning, design, approvals, and permitting needed for construction projects. The Office of Safety, as well as our Safety Specialists in our field offices, are prepared to help advance these important, life-saving investments. Presented by FHWA, American Traffic Signal Services Association (ATSSA) and National Association of County Engineers (NACE) on February 25th is available for replay at http://www.atssa.com. Presented by FHWA for Safety Specialists, Local Technical Assistance Program (LTAP), and some members of the American Public Works Association (APWA) on March 4th is available for replay at http://fhwa.na3.acrobat.com/p67913180/. It has been estimated that freeway work zones account for nearly 24 percent of non-recurring delay, and 10 percent of overall delay. 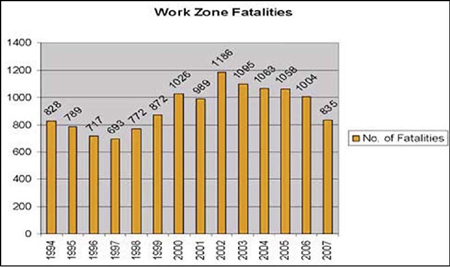 The number of people killed in work zone crashes remains significant (835 in 2007). Safety and mobility impacts from work zones will likely be magnified with the infusion of a large number of new projects under the American Recovery and Reinvestment Act. Appropriate planning, coordination, sequencing, and scheduling of projects will be critical in order to minimize conflicts and delays, and to maintain an acceptable level of mobility and safety during construction. Visit https://www.fhwa.dot.gov/economicrecovery/workzones.htm for online resources that provide information and guidance on specific aspects of work zone safety. In 2005 and 2006, the Missouri Department of Transportation (MoDOT) undertook the Smooth Roads Initiative (SRI) to improve safety, visibility and “ride ability” of over 2,000 miles of the State’s most heavily-traveled roadways. The SRI program affected most of Missouri’s Interstate highway system, other freeways and expressways and a small number of multilane and two-lane undivided roads. The SRI routes, though small in number, constitute 60 percent of all vehicle miles traveled on MoDOT’s 32,000-mile State highway system. In 2007, MoDOT contracted Midwest Research Institute (MRI) to evaluate the safety effectiveness of the SRI improvements, perform a benefit-cost evaluation, and assess public perception of the improved striping and delineation. The study was completed in October 2008. A before/after evaluation was performed using the Empirical Bayes (EB) method to estimate the safety effectiveness of specific striping and delineation improvement packages used in the SRI program. Due to the recent completion of the program (2006), only one year of after data (2007) was available. Even with this small data set, the striping and delineation program resulted in a statistically significant reduction of fatal-anddisabling-injury crashes (8 percent) and fatal-and-all-injury crashes (6 percent). Over a period of five years from 2007 through 2011, the striping and delineation program is expected to reduce approximately 50 fatal crashes, 300 disabling injury crashes, 1,100 minor injury crashes, and 3,800 property damage only crashes. The overall results show the SRI program was an excellent investment in safety improvement for MoDOT. Wider markings and shoulder rumble strips with resurfacing on urban multilane divided highways (B/C = 27). A survey of Missouri motorists was conducted to assess public perception and satisfaction with the striping and delineation treatments. The survey found that nearly 87 percent of respondents had noticed the new SRI improvements. Those improvements most noticed by respondents were rumble strips, followed by the improved visibility of the new lane markings. Fifty-three percent of respondents found the edge line and lane line improvements to be helpful. Fifty-six percent of survey respondents indicated that shoulder and centerline rumble strips were helpful in preventing drivers from leaving their lane unintentionally. 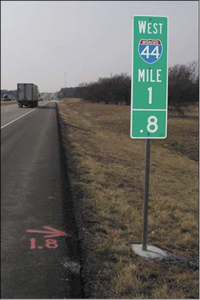 More than half of survey respondents (57 percent) believed the striping and delineation improvements increased the general level of safety on Missouri roadways. A substantial majority of respondents (79 percent) believed the improvements have been a good investment of taxpayer dollars, and 80 percent of respondents would like to see these improvements implemented more widely in the future. 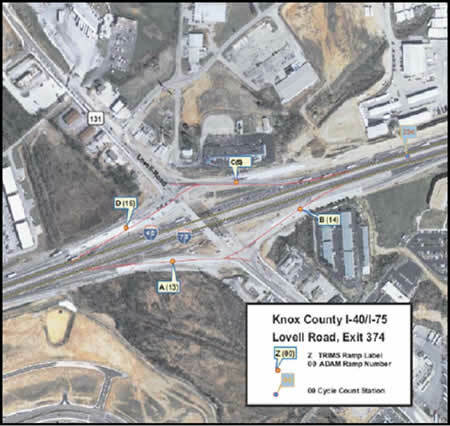 The research results suggest that MoDOT may proceed with future striping and delineation improvements, confi dent that such improvements make a substantial contribution to safety and are well received by the motoring public. The availability of only one year of after-period crash data limits the ability to obtain statistically significant evaluation results. MoDOT plans to repeat the safety evaluation in 2010, when three years of data will be available. MoDOT has already moved forward, focusing its efforts on another portion of the State’s highway system. The Better Roads, Brighter Future (BRBF) program is making similar improvements to another 3,300 miles of Missouri roads. Efforts began in 2007 and will continue through 2011, at which time 80 percent of Missouri’s State route vehicle miles will be on substantially improved highways. Special thanks to the following members of the Midwest Research Institute for their assistance in the preparation of this article. April 6-10 marked the 10th anniversary of National Work Zone Awareness Week. The national campaign is conducted every year at the start of the construction season to remind motorists to drive carefully through highway construction and repair sites. In an attempt to mitigate congestion and enhance safety on major expressways, Tennessee is implementing a Ramp Queue Program at various interchanges across the State that have increased congestion and a history of crashes. “The possibility of a catastrophic event occurring at these locations elevates the proactive approach in providing a safer facility,” states Steve Allen, Director of Project Planning for the Tennessee Department of Transportation (TDOT). TDOT believes this program is a programmatic approach for safety improvements. Tennessee plans to implement eight projects this year (two in each region). Each project will begin with traffic analysis, followed by a Road Safety Audit (RSA) to identify the issues. Safety improvements will include widening ramps at intersections to provide additional storage, traffic signal upgrades, signing, additional Intelligent Transportation Systems, ramp metering, and relocating signal heads. All projects will be within existing right-of-way of TDOT and will have a funding cap of $2M per project. This program will be implemented with Highway Safety Improvement Program funding. The Montana Highway Patrol (MHP) has created a six-person roving unit to patrol Montana’s high-enforcement corridors. This roving unit, which includes one sergeant and five troopers, is funded by a grant from the Montana Department of Transportation (MDT). The purpose of this unit is to create an increased law enforcement presence on roadways with the highest crash rates. MDT also funds the Selective Traffic Enforcement Program (STEP) which enables local law enforcement agencies to increase patrols on high-enforcement corridors within their jurisdictions. The combined efforts of MDT, MHP and local law enforcement contributed to a decrease in crashes from 1,061 in 2006 to 997 in 2007. Fatalities and serious injuries along these corridors decreased from 156 in 2006 to 107 in 2007. There were 23 fatalities on the high-enforcement corridors in 2006, compared to 12 in 2007. This data shows that Montana is meeting and exceeding its long-term goal to reduce fatalities and injuries on Montana’s roadways. The efforts demonstrate that increasing enforcement on high-enforcement corridors at the right times and in the right areas can save lives. Making our roads safer through a data-driven, systematic approach and addressing all “4Es” of safety: engineering, education, enforcement, and emergency medical services. Increasing awareness of the need for roadway safety infrastructure improvements is very important. Safety should be considered fi rst, every time and at every stage of a project. Cook County (MN) Highway Department, for a campaign to highlight the importance of roadway safety interventions. The campaign is funded through a grant from the Federal Highway Administration (FHWA) and was developed to raise awareness of the safety benefits and the need for infrastructure and engineering roadway safety improvements. Panel judges included representatives of RSF, FHWA, AARP and AAA. With the goal of achieving further advancements in highway safety, the Pennsylvania Department of Transportation (PennDOT) has established several programs to focus available knowledge and resources where they might afford the greatest good. Among these efforts, PennDOT has instituted two programs within its Local Technical Assistance Program (LTAP), namely the Local Safe Roads Communities Program (LSRCP) and the Walkable Communities Program (WCP). Both of these programs are focused on local road safety and offer a process of identification and recommendation for low-cost remediation of high safety risk areas to municipal leaders at no cost for the service. In Pennsylvania, there are about 1,500 traffic-related fatalities each year. According to PennDOT’s crash data report, 2007 Pennsylvania Crash Facts and Statistics, pedestrian fatalities comprise 10.4 percent of all traffic fatalities, a figure similar to national statistics. Of these pedestrian fatalities, almost half (46.5 percent) occurred in rural municipalities, while two-thirds (66.9 percent) of pedestrian crashes occurred within Pennsylvania cities, suggesting that while there are more pedestrian crashes in cities, the severity of crashes in more rural environs is greater. Vehicular crashes on local roads comprise 28.5 percent of crashes in Pennsylvania and 18.6 percent of fatalities. More telling are fatality rates per 100 million vehicle miles travelled. The rate for state-owned highways is 1.25, while the rate for local roadways is 1.49. 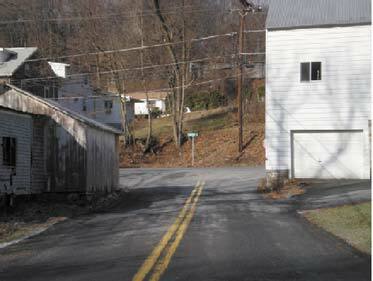 PennDOT developed its LSRCP, and its WCP to help assist municipalities with achieving safety improvements. These programs focus on roadway environment factors through field views, research, crash analyses, and discussions with municipal staff to determine the root causes of the crashes at particular locations of concern to municipal officials. After the root causes of the crashes have been identifi ed, LTAP engineers suggest appropriate shortterm and long-term low cost safety improvements and countermeasures to mitigate those causes. The purpose of the Walkable Communities Program is to measurably improve pedestrian access and safety. The goals of the WCP and the LSRCP are similar in that both intend to reduce crashes on local roads by about 20 percent in Pennsylvania. Each program seeks the participation of about 10 communities across Pennsylvania each year. The WCP intends to help participant municipalities through the development of a Pedestrian Safety Action Plan specific to the target community. 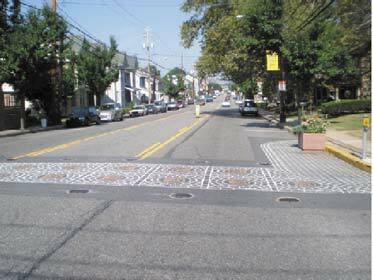 The purpose of the WCP is to measurably improve pedestrian access and safety within Pennsylvania by providing communities with a head start on a walkability and pedestrian safety improvement program focused primarily on implementing low cost safety improvements. The kinds of walkability problems encountered by the LTAP engineers through the course of investigating high safety risk locations within the participating communities include; unusual crosswalk locations that are difficult to predict by drivers (see Photo 1), crosswalks that are difficult for drivers to see, long crosswalks that sometimes seem to go nowhere (see Photo 2), and improperly used signs (see Photo 3). Likewise, the LSRCP examines several areas of concern to local officials within a municipality and assists with the development of a Roadway Safety Improvement Plan specific to the target community. The purpose of the LSRCP is to measurably improve safety on locally owned roads within Pennsylvania, but with a focus on vehicle crashes at high safety risk locations along local roads. 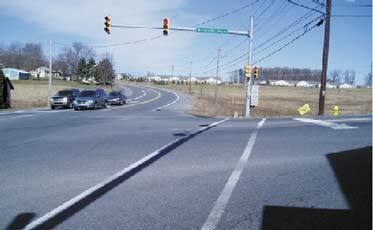 The kinds of local road safety issues encountered by Pennsylvania LTAP engineers are typically winding roads (see Photo 4), roads with narrow or non-existent clear zones (see Photo 5), obscured or otherwise difficult to read signs and incorrectly placed signs (see Photo 6), and intersections with unusual geometries that make traffic movements difficult to predict by drivers. Photo 2 - A long crosswalk that seems to go nowhere. Crossing times for the elderly, for children, and for special needs persons will be long. Also, the parallel lines crosswalk marking is common, but may not be as visible as other crosswalk markings. Photo 3 - Improperly used crossing signs. 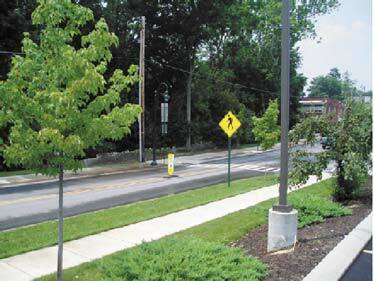 The stand-alone pedestrian sign should be on the centerline in advance of the crosswalk. In Pennsylvania, there are about 1,500 traffic-related fatalities each year. Photo 4 - Winding roads, particularly when narrow, are difficult for drivers to negotiate while remaining within their lane. Photo 6 - Obscure or otherwise difficult to see signs. Also, signs may be incorrectly placed, limiting their intended effectiveness. The Pennsylvania LTAP has crafted a methodology that allows traffic safety engineers to quickly identify a few of the high crash locations within communities, focusing specifically on local roads and local road intersections with PennDOT roads, and to develop low-cost solutions to mitigate the crash potential at those locations. Further, this process of identifying and evaluating high crash potential locations and implementing safety improvements, conducted initially by the traffic safety engineers, may be transferred to community officials, encouraging the development of plans for systematically continuing the safety effort. Low cost safety improvements are safety countermeasures to address specific crash causes at an intersection or roadway that may be implemented at relatively little cost by municipal forces. 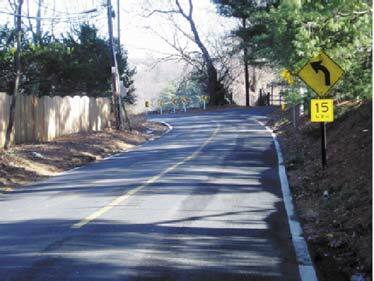 Low cost safety improvements may include installing appropriate traffic signs, pavement markings, removing inappropriate traffic signs, or improving sight distance. 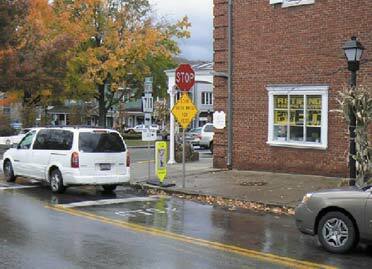 For example, providing a stop bar at a stop sign controlled intersection improves the driver’s recognition of the stop condition, and may reduce potential crashes by 15 percent (source: FHWA). Other low-cost countermeasures that are often recommended include improved crosswalk markings and signing (see Photos 7 and 8), bulb-outs (see Photo 9), warning pavement markings (see Photo 10), and improved curve signing and delineation. Vehicular crashes on local roads comprise 28.5 percent of crashes in Pennsylvania and 18.6 percent of fatalities. In addition to the low cost safety improvements, longer term solutions are identifi ed, if appropriate. Longer term solutions include roadway widenings, roadway realignments, roundabouts, new sidewalks, traffic signals, and others. Clearly, these kinds of improvements can be expensive and often figure into long-term safety plans. The Roadway Safety Improvement Program/Pedestrian Safety Action Plan given to each participating community includes guidance on establishing an annual plan by developing observation and implementation strategies that contribute to establishing a community culture of roadway safety. Community officials may determine if the recommended measures are appropriate from their experiential perspective, as well as prioritize the recommendations, applying safety measures on a protracted basis as resources allow. Officials are encouraged to monitor the safety impacts at each of the improved locations after countermeasures have been implemented soon after the measures have been implemented, after three to six months, and again after one year. Reports for approximately fifteen participating communities were delivered in 2008 and early 2009. Follow-up meetings have been conducted with several of those communities and responses from community leaders have been enthusiastic. Many low-cost countermeasures have been implemented, with more planned. The immediate result has been municipal officials sharpening their focus on improving roadway safety, and making plans with the tools and methods to accomplish their goals. 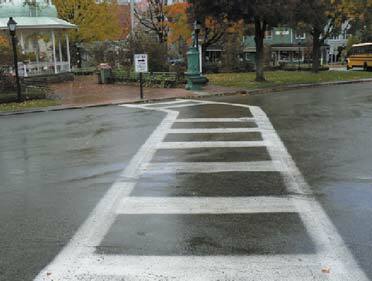 Photo 7 - New crosswalk markings that allow communities flexibility in materials and design are approved for use by PennDOT. Photo 9 - An example of sidewalk bulbouts, which provide greater visibility for both motorists and pedestrians, and also shorten the distance of exposure for pedestrians using the crosswalk. There were 172 fatalities in Nevada last year related to motorists drifting out of their lane of traffic. Along Nevada’s rural routes, the routine desert backdrop can lull drivers into inattention. To help steer motorists toward safety, the Nevada Department of Transportation (NDOT) is installing rumble strips in the center of over 1,300 miles of two-lane rural State roadways where there are high fatality and injury rates or concerns. The work, performed by MKD Construction, is part of an approximately $2 million contract to install centerline rumble strips on certain State rural roads. The statewide safety project is expected to be complete in early 2009. The project was developed and managed by NDOT Safety Engineering, with design by NDOT design experts and construction overseen by NDOT engineering staff throughout the State. The Nevada Strategic Highway Safety Plan identifi es centerline rumble strips as one cost-effective way to reduce crashes and increase safety on the State’s roadways. Led by NDOT and the Office of Traffic Safety, the plan brings law enforcement, transportation agencies and safety advocates together to define ways to reduce Nevada traffic injuries and fatalities. The plan is available for viewing on-line at http://www.drivesafenv.com. Everyone recognizes that vehicular crashes are devastating events. But tracking where - and ultimately fi guring out why - crashes happen provides the specific insights we need to find solutions. 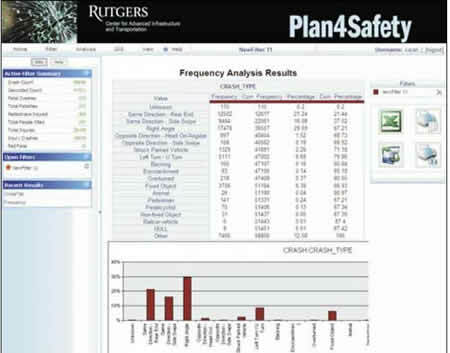 Plan4Safety software, developed by the Transportation Safety Resource Center (TSRC) at Rutgers’ Center for Advanced Infrastructure and Transportation (CAIT), is a valuable new tool that helps us understand and take measures to solve the problem of roadway crashes through data-driven decisions. There are a multitude of safety countermeasures that may alleviate the incidence of crashes; however, determining what could work in a particular situation requires crash data analysis. Developed under the direction of Patricia Ott, director of the New Jersey Department of Transportation’s Division of Traffic Engineering and Safety, Plan4Safety is a free web-based application available to all state, county, and local safety professionals involved in engineering, enforcement, and education. The program was launched in January 2008. This state-of-the-art software compiles, organizes, and sorts the full New Jersey database of crash records from 2003 through 2007, a total of approximately 1.6 million records (2008 data will be added as soon as it is available). If that sounds like a lot of information, consider that each of those 1.6 million records may contain up to 144 distinct pieces of data, including the type of crash, level of injury, type and number of vehicles involved, weather and light conditions, driver data not linked with personal identity (e.g. age and gender), location, time of day, and so on. In addition to being a useful tool and information resource, Plan4Safety is a web-based application accessible to authorized users from any internet-capable computer, eliminating the end-users’s need for uncommon power, processing speed, and support applications. This means it is accessible to virtually all New Jersey transportation professionals. Users are able to quickly search incident records, filter data in myriad ways, and instantly compare and contrast information. The results are a snapshot of the “who, what, where, when, and how” of road crashes. TSRC and the New Jersey Local Technical Assistance Program (NJ LTAP) have been promoting the use of Plan4Safety to local agencies for the past year, and have provided software training to more than 100 professionals. The Plan4Safety team demonstrates for potential users how the program can work for engineering, enforcement, education and planning professionals by using examples apropos to each constituency. In addition to general product overviews, the TSRC team does is personalized training tailored to the specific needs and concerns of a particular customer group. In addition to helping Ocean County, examples in which Plan4Safety has helped communities include an intersection and corridor analysis done prior to conducting meaningful road safety audits; finding all the young pedestrian crashes within a one-mile radius of select schools for a Safe Routes to School application; finding crashes that involved a motorist running a red light for communities seeking to install red-light-running cameras; and conducting cluster analyses for police departments to determine the best placement for concentrated enforcement campaigns. Currently, the program integrates the full crash database with key components of the roadway characteristics database known as Straight Line Diagrams (SLD). TSRC plans to continue making Plan4Safety available to all users in New Jersey who require the information, and hope to move the program to the next level— integrating additional data elements such as pavement condition and emergency medical crash records, among others. With this much data at users’ fingertips, questions we have not yet even thought of will be able to be answered. The question will no longer be “how do we solve this?” but “when?”. Last summer’s high gas prices, followed by the economic downturn, may have resulted in at least one positive outcome – a reduction in highway-related fatalities. A January 2009 survey of state highway safety agencies by the Governors Highway Safety Association showed that average fatalities dropped by 10.7 percent nationwide, while vehicle miles traveled were down 2.9 percent from 2007 to 2008. That downward trend can also be seen in highway rail grade crossing collisions, which dropped by 13.8 percent last year, according to preliminary 2008 statistics from the Federal Railroad Administration. The number of motorists killed in last year’s highway-rail collisions also dropped by 14.6 percent and injuries were down by 12.8 percent from 2007. These figures continue a long-term trend. Thanks to the combined efforts of Operation Lifesaver’s safety partners, including federal, state and local governments and law enforcement agencies, along with improved engineering at highway-rail intersections and Operation Lifesaver’s rail safety education programs, the number of lives lost in crossing crashes has plummeted 59 percent since 1990 alone. Today’s crossing safety challenge: To push those numbers down further. Operation Lifesaver is working to expand its relationship with the traffic safety community, so that highway-rail safety takes its rightful place as part of the broader highway agenda. What is Operation Lifesaver? This non-profit, international continuing public education program began in 1972 to end collisions, deaths and injuries at places where roadways cross train tracks, and on railroad rights-of-way. With grant funding from FHWA, Operation Lifesaver, Inc. (OLI) serves as a national support center to enhance the safety efforts of 50 individual state programs, while working nationally to promote safe driving practices at highway-rail intersections. Volunteer speakers trained and certified by our organization provide free safety presentations for anyone who lives and travels near train tracks. OLI safety leaders and volunteers are in communities all across the country, delivering safety messages to school children, driver education students, professional drivers, law enforcement, emergency responders, and other community groups. OLI develops and distributes safety materials, and has produced awardwinning public service advertising (PSA) campaigns to raise awareness about the need for caution around tracks and trains. Because engineering is one of the “3 E’s” of Operation Lifesaver’s efforts (along with education and enforcement), we will be increasing our outreach to the highway engineering community. Our goal is to secure strong, active partnerships and build alliances to ensure that OLI incorporates the most current engineering laws and standards in all educational materials. Improving pedestrian safety - a common goal: FHWA’s effort to improve pedestrian safety dovetails with recent Operation Lifesaver pedestrian rail safety initiatives. Since 1997, more pedestrians have died each year while on or near train tracks than motorists killed in highway-rail crossing collisions. Operation Lifesaver is retooling its public outreach effort to remind people that walking on train tracks is trespassing on private property. We applaud the FHWA Office of Safety’s goal of reducing pedestrian fatalities and injuries by 10 percent by the year 2011. Operation Lifesaver’s pedestrian rail trespass prevention initiatives can help. We are developing new materials and outreach channels, including expanded use of the internet, to disseminate safety education information. Our education materials are also produced in Spanish and other languages to meet the needs of a diverse population. Our new animated PSAs include messages for drivers and pedestrians (view them at http://www.oli.org/shark). Thanks to the longstanding partnership between Operation Lifesaver and FHWA, together we have contributed to a remarkable safety success story. For more information on Operation Lifesaver and its safety programs, visit our website at http://www.oli.org/. I welcome your ideas and other input: you can contact me by email at hsramek@oli.org. 924.1 Purpose – Now includes evaluation, which was an existing element of the program but was originally omitted from this section. 924.3 Definitions – Adds 17 definitions using terms from 23 U.S.C. 148 as a basis and clarifies/corrects some terms that were included in the previous regulation. 924.5 Policy – Changes the objective of the program from reducing crashes to significantly reducing the occurrence of and the potential for fatalities and serious injuries resulting from crashes on all public roads. 924.7 Program Structure – Adds new SAFETEA-LU program elements such as the Strategic Highway Safety Plan (SHSP) requirement and the High Risk Rural Roads Program (HRRRP) set-aside. 924.9 Planning – Includes detail relating to data quality, improving data systems, and data analysis. 924.11 Implementation – Incorporates elements that address how the funding is spent such as the HRRRP set aside, the 10% flex provision, leveraging funding resources, and federal share details. 924.13 Evaluation – Shifts the focus from project evaluation to program evaluation. 924.15 Reporting – Incorporates the new reporting requirements from SAFETEA-LU such as the HRRRP and the 5% report and shifts some of the project related reporting to program reporting. The revised regulation represents a culmination of efforts through stakeholder meetings, the public rulemaking process (including a Notice of Proposed Rulemaking (NPRM) and subsequent public comment), and coordination between the FHWA Office of Safety and other FHWA offices and the US DOT. Why was 23 CFR 924 Updated? Safe, Accountable, Flexible, Efficient Transportation Equity Act: a Legacy for Users (SAFETEA-LU) significantly strengthened the HSIP, doubling its size to over $1B per year and moving it from a “set-aside” to a core stand-alone program. The revised rule incorporates changes to the HSIP that resulted from SAFETEA-LU, and reflects changes in the overall program that have evolved since the FHWA originally published 23 CFR Part 924. What Do States Need To Do Now? The new regulation was published in the Federal Register on December 24, 2008 and became effective on January 23, 2009. 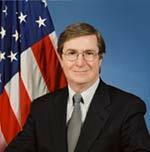 The regulation can be viewed at: http://edocket.access.gpo.gov/2008/pdf/E8-30168.pdf. States should download the new regulation if they have not already done so. State DOTs should review the new regulation and update their HSIP processes, where needed, to comply. States are encouraged to ask questions and seek help, if needed, in order to better understand the regulation and how it affects their HSIP. The FHWA Office of Safety’s website contains several documents regarding the HSIP program. The new regulation, including the preamble explaining the new regulation in more depth, as well as other HSIP-related documents can be viewed at: http://safety.fhwa.dot.gov/hsip/policy_guide/#code. Other documents related to the new regulation will be placed on the web site as they are available. When SAFETEA-LU (Safe Accountable Flexible Efficient Transportation Equity Act – a Legacy for Users) was enacted, Florida, like other States, initially struggled to pull its safety partners together to develop a comprehensive, meaningful, and effective Strategic Highway Safety Plan (SHSP). The resulting SHSPs are as varied as the States themselves, but in many ways they are also similar. After the SHSP had been approved, Florida immediately focused its attention on implementation and the need to track or record the numerous and varied efforts to implement the SHSP. Florida Department of Transportation (FDOT), the lead agency in the Florida’s SHSP, went to work to develop a mechanism to track SHSP implementation efforts. Through the efforts of a dedicated team from FDOT’s Business Systems Support Office, a web based safety program tracking tool was developed. Safety partners throughout the State can access this easy-to-use tool to enter information about their SHSP projects and programs. This information can include project name, contact name, agency, source of funding, brief description of the project, the emphasis areas (aggressive driving, lane departures, intersection crashes, vulnerable road users) and/or continuing priority areas (impaired driving, occupant protection, data), the project implements, and begin and end dates. Prior to an entry being posted, it must be approved by the administrator in the safety office to ensure the propriety of the information provided. A very helpful feature of the tracking tool is that the data fi elds are searchable. For example, one can search for the number of projects a particular agency has entered, or how many projects implement a specific emphasis area. In addition, the site provides short, computerbased training sessions for those who encounter difficulties using the tracking tool. A help line number is also included. The tracking tool and its search capabilities aids the safety office and each of the department’s district offices in reporting their SHSP activities bimonthly to the DOT Executive Board. Additionally, because FDOT developed this product in house, the tracking tool application can be provided without cost, complete with source codes, to any other State or governmental agency that may be interested in developing something similar. 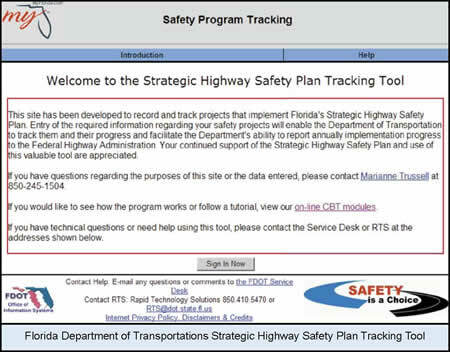 FDOT is proud of this tool and the information it can provide users regarding implementation efforts of Florida’s SHSP. Since many more projects are underway than are being tracked, Florida’s safety partners are constantly educating and reminding everyone that traffic safety initiatives need everyone’s effort, as do the SHSP and the tracking tool. Lane departure crashes – including run-off-road and crossed-centerline incidents – account for 61 percent of Iowa’s traffic fatalities. 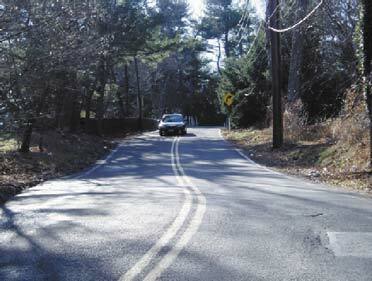 Many of these crashes occur on horizontal curves in rural areas. The Iowa DOT has several mitigation strategies for curves that would reduce the number of these crashes. Tom Welch, State transportation safety engineer for the Iowa DOT, explains that the high-crash curve list is part of Iowa’s ongoing efforts to implement more systematic and cost-effective safety improvements. With a limited budget and 100,000 miles of public roadways, the State cannot simply mandate an improvement—like centerline rumble strips—on all roadways, or even just on rural horizontal curves. Targeted systematic approaches are needed to identify crash-prone roadway sections so that focused mitigation strategies can be implemented. 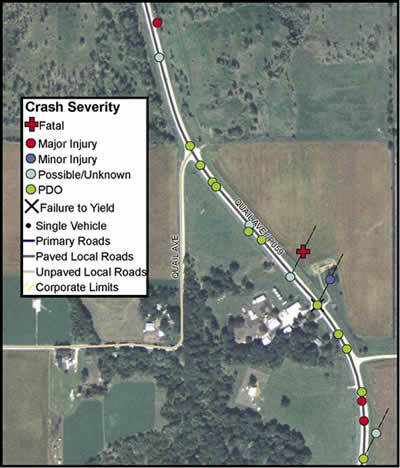 With Iowa DOT sponsorship, the Center for Transportation Research and Education (CTRE) at Iowa State University has developed a method for identifying those rural curves where most of the crashes are happening. The resulting list of Iowa’s high-crash curve locations can help safety engineers implement targeted, inexpensive mitigation strategies that maximize return-oninvestment for highway safety funds. Because of these lane departure crashes, the FHWA and AASHTO have identifi ed Iowa as an “opportunity State” for improvement. CTRE researchers have been developing a largely automated, systematic method for identifying the problematic curves on Iowa’s primary and secondary road systems. The innovative, low-cost method relies on and adds value to two preexisting data sets that the Iowa DOT has on hand. One set, GPS positioning data taken at ten-meter intervals on all of Iowa’s primary and paved secondary roadways, was extracted from a pavement distress database compiled by Roadware Group Inc. Using the data’s existing functionality as much as possible, the researchers developed a technique to distinguish horizontal curves from straight roadway segments. The resulting curve database comprises all horizontal curves of different lengths and shapes on Iowa’s primary and paved secondary roads. The second data set includes crash data that the Iowa DOT collects every year. The primary data parameter used to identify high-crash locations was crash frequency, weighted by crash severity. Animal crashes and intersection crashes, unlikely to be primarily curverelated, were excluded from the count. To identify the State’s most problematic horizontal curves, the researchers crossed seven years of crash data with the curve database. The result was a list of over 200 curves, all of which were ranked by crash frequency and severity. For each of these curves, the crashes were color-coded and plotted on an aerial photograph to help with the review process. Targeted systematic approaches are needed to identify crash-prone roadway sections so that focused mitigation strategies can be implemented. The State’s initial safety improvements are focusing on the top 30 curves from the 200-item list. While these 30 are not meant to represent a definitive list of the State’s worst curves, they do represent sites that are likely to benefit from improvements. The core value of the list is that it gives counties and local districts—who received the list in November 2008—the opportunity to address their high-crash curves. Any decisions about how to proceed ultimately rest with the county engineers and Iowa DOT districts. Initial feedback from counties and local districts confirms that the curves on the list are recognized as problems and thus validates the method used to identify high-crash curves. Some owner agencies have asked for advice about specifi c lowcost mitigation strategies and plan to apply for safety funds. Mitigation strategies may include, for example, paving shoulders, constructing centerline rumble strips, improving signing and pavement markings, adding chevrons, or similar targeted improvements. Some counties and local districts have already implemented safety improvements on their listed curve or have secured safety funding for the improvements. In addition to its role in optimizing limited highway safety funds, the curve database is fairly inexpensive to develop. The method leverages existing data or data that can be acquired easily through other State projects—such as snow plow routes and pavement distress surveys. The method’s automation also significantly reduces the labor required to identify every curve on the road system via visual inspection. This reduces the likelihood of human error and inconsistent classification. Additionally, because all of the State’s curves are maintained in a database, the list of the 30 highest-crash curves can easily be updated when new crash data are compiled annually and can be distributed every year with the federally mandated 5% report. Researchers anticipate that the comprehensive curve database could eventually be used to identify the characteristics of problem curves and preventively mitigate crashes. Iowa researchers are currently refining the curve identification methods and filtering out noise in the database by removing stray roadway segments that don’t belong. They’d also like to make the methods more transferable to other States that can provide similar data inputs. Other States have already expressed interest in the methods Iowa has used to develop its high-crash curve database. Ultimately, the system has the potential to be an important tool for reducing some of the most serious - and the most difficult to target - crashes on U.S. roads. Pedestrian fatalities tend to be sporadic events that do not typically occur at the same location or under the same conditions, making it difficult to find methods to minimize them. In an attempt to come up with a solution to this problem, in 2003 the Federal Highway Administration awarded grants to the cities of San Francisco, Las Vegas and Miami to develop plans for deploying and evaluating various pedestrian safety countermeasures in high crash “zones” and locations. 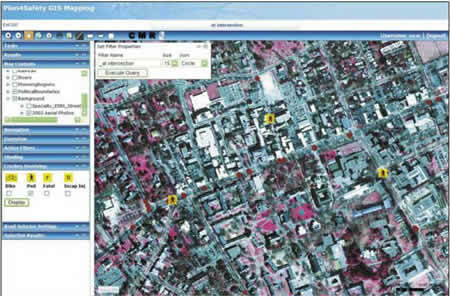 The purpose of the project was to demonstrate how a city could improve pedestrian safety by performing a detailed analysis of its pedestrian crash problem, identifying and evaluating high crash locations, observing factors such as driver and pedestrian behavior, and deploying various lower-cost countermeasures tailored to the site. An independent evaluation was also conducted to compare the countermeasure deployment across the three cities. The complete list of countermeasures and where they were deployed is shown in Table 1. Since it takes a few years for the effects of a treatment to make an impact on crashes, crash data was not yet available for San Francisco and Las Vegas at the conclusion of the project. Instead, researchers mainly looked at “measures of effectiveness” (MOEs) related to pedestrian and driver behavior to determine if there was a safety improvement. Using these MOEs and comparing them across sites, seven countermeasures were identifi ed as being highly effective in improving pedestrian safety. They were: leading pedestrian interval; pedestrian countdown signals; in-street pedestrian signs; activated flashing beacons; rectangular rapid flash beacon; call buttons that confirm the press; and Danish offset combined with high visibility crosswalk, advance yield markings, and YIELD HERE TO PEDESTRIANS signs. In Miami, MOEs were also used, but more extensive crash data was already available. Prior to the start of FHWA’s project, the National Highway Traffic Safety Administration (NHTSA) had undertaken a study in Miami to look at the effects of implementing law enforcement and education programs on pedestrian crash data. Data had been collected for six years prior to the introduction of the NHTSA project. Data collection continued during the three years that the NHTSA project was implemented, and for an additional two years during FHWA’s project, thus yielding a total of 11 years of crash data along specifi c high crash corridors. Amazingly, the installation of the engineering countermeasures, in addition to NHTSA’s education and enforcement efforts, led to a 50% reduction in pedestrian crashes. Overall, it appears the project successfully demonstrated that a locality can make targeted, low-cost improvements and have an impact on its pedestrian safety problem. Each city spent only about $1 million on countermeasures over the six-year period. The in-depth final reports from each location, as well as the independent evaluation, are available for viewing at: http://safety.fhwa.dot.gov/ped_bike/tools_solve/ped_scdproj/. The Federal Highway Administration (FHWA) has produced the Strategic Intersection Safety Program Guide, FHWA Publication No. FHWA-SA-09-004. The Guide may be useful for State and local agencies developing an intersection safety program, including associated action plans for projects. It provides a step-by-step process for developing the intersection portion of a State Strategic Highway Safety Plan (SHSP), and other guidance to assist local agencies with their individual intersection safety programs. Combination approach, which combines any or all of the above three approaches. Many intersection safety programs have used a combination of these approaches to strategically address the identifi ed safety improvement needs, including crash reduction goals. The Guide points out that a strategic program involves the 4-E’s (engineering, enforcement, education and emergency services) that affect intersection safety. 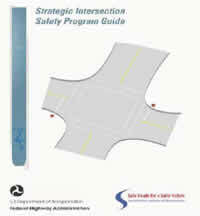 The guide is available at the Office of Safety website at http://safety.fhwa.dot.gov/intersection/fhwasa09004/. The call for nominations officially began in January 2009 with a June 1, 2009, deadline for submissions. For nearly a decade, this biennial program has recognized the best and brightest in safety programs including Infrastructure, Operations and Program Planning Development and Evaluation. Prior winners have received nationwide media attention, additional hometown recognition, a general increase in safety program awareness and, in some cases, funding opportunities for their award-winning programs, so there is no shortage of reasons to apply! For more information, visit http://www.roadwaysafetyawards.org/. Speeding is one of the most common contributing factors of traffic crashes. Data extracted from the Fatality Analysis Reporting System (FARS) show that the driver-level attribute “driving too fast for conditions or in excess of posted speed limit” is the critical contributing factor in more than 99% of all speeding-related fatal crashes, as defi ned by the National Highway Traffic Safety Administration (NHTSA). A marginal number of drivers were determined to be speeding through citations of speeding violations reported to FARS. On December 21, 2007, the Federal Highway Administration revised the Manual on Uniform Traffic Control Devices (MUTCD) when it published a Final Rule on Sign Retroreflectivity in the Federal Register. The Final Rule established maintenance criteria for minimum retroreflectivity of traffic signs. This revision included compliance dates by which agencies must establish a maintenance method and meet the retroreflectivity criteria. FHWA is currently working to develop a proposed rule for minimum retroreflectivity of pavement markings as well, which is expected to be incorporated into the MUTCD in the future. With these two efforts moving forward, agencies are gaining experience and expertise in maintaining sign and marking retroreflectivity. The Signing and Marking Materials Committee (AHD55) of the Transportation Research Board (TRB) is soliciting agencies that are actively maintaining their sign and/or marking retroreflectivity, or have active plans for doing so, to share their experiences with others. Administrators, practitioners and researchers are encouraged to submit a description of their current or planned sign and/or pavement markings retroreflective maintenance practices. From these submissions, presentations on retroreflectivity maintenance programs will be selected for inclusion in one or more TRB webinars to be held in 2009. Also, presentations may be selected for inclusion in a special session at the 2010 TRB Annual Meeting. Guide for Addressing Collisions Involving Motorcycles. thousands of families to increase health and environmental benefits at the second Safe Routes to School National Conference at the Hilton Portland, Oregon. Save the date: August 19-21, 2009 – preconference health workshop on August 18, 2009. Please check http://www.saferoutesconference.org for registration information. The National Highway Institute announces the launch of three new training courses in the safety program area. This course provides participants with tools for evaluating the safety performance of horizontal curves, along with suggestions for countermeasures that could improve safety performance. This is a blended course that includes a self-paced, web-based training module, as well as an instructor-led portion. The course provides a background of CRF, including terminology, the components of a CRF, and how to identify and interpret appropriate CRFs. It also provides hands-on experience with safety diagnosis and the application of CRFs to compare the effectiveness of countermeasures. This course provides participants with the knowledge and skills needed to critically assess the quality of CRFs. Topics include the concepts underlying the measurement of safety, the development of CRFs/AMFs, and the key statistical issues that affect the development of quality CRFs. The course also examines the key methodological issues and statistical thresholds that affect the development of quality CRFs. Highway designers often face many complex trade-offs. A quality design satisfi es the needs of a wide variety of users, and it must balance cost, safety, mobility, social, and environmental impacts. Good design requires more than simply assembling elements from the available tables, charts and equations of criteria. This course provides participants with knowledge to make informed decisions when applying engineering judgment and flexibility to geometric design. For more information on these courses, contact Thomas Elliott, NHI Training Program Manager at (703) 235-0319. 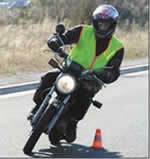 New TSI Motorcycle Safety Course Helps State-Level Planners. To reaffirm its commitment to motorcycle safety as a major component in comprehensive highway safety programs at the state and federal levels, the National Highway Traffic Safety Administration (NHTSA) has partnered with the National Traffic Safety Division of the Transportation Safety Institute (TSI) to develop and deliver a Motorcycle Safety Program Coordination training course. NOTE: 2007 Railroad-Highway Grade Crossing Handbook Corrections. An error in the final collision prediction formula, formula (2), on page 56, and errors in the two formulas for determining the length of a taper for a work zone set up in the last line on page 175 and fi rst line on page 177 have been corrected in the electronic version of the Handbook available on our Web site at: http://safety.fhwa.dot.gov/xings/com_roaduser/07010/.